After more than a decade of production, the New Beetle's grown mighty stale and, more importantly — effeminate. 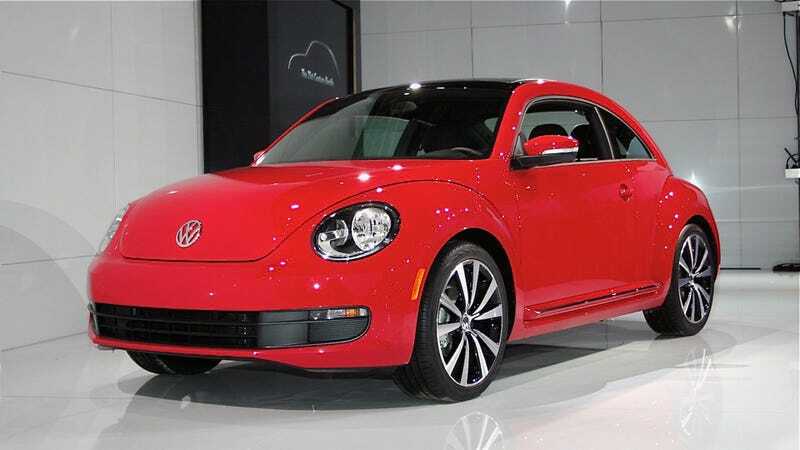 The all-new 2012 Volkswagen Beetle ditches the flowers for more power, bringing design and engineering back into this century with a masculine look decidedly planted in the last one. UPDATE: Live photos from the New York City unveil, plus Volkswagen marketing boss Luca De Meo explains how the new Beetle will "handle like Herbie." How the 2012 Beetle will handle "like Herbie"
These days, marketers believe that the death knell of a car comes when people consider it's too "girlie." And that's precisely the one broad stroke the second-generation Beetle found itself brushed with. The new Beetle that drops the "New" — which wasn't supposed to be revealed for another hour until Motor Trend and others were apparently so excited they dropped some of the embargoed news five hours early — is supposed to get a bit more man-like. The first thing you'll notice from the slew of images V-Dub's dropped of the new Beetle is that it shows a longer, wider, more coupe-ish Beetle that ditches the "triple bubble" design and replaces it with a much more strongly-raked rear windshield. The shape overall exudes a sportiness that looks like it was pulled, kicking and screaming, from the Porsche branch of the family tree. But some of the Beetle's longstanding characteristics — like its round headlights (optional bi-xenon headlights with LED daytime running lights are available for the first time in this model series), the flared wings, the shape of the hood, the little scarab's sides and door sills and large wheels (now up to 19 inch) — remain. A new feature is a integrated rear spoiler (standard for TSI engines with 118 kW / 160 PS and 147 kW / 200 PS) with a top surface that is always black, and an underside painted in any of the car's 12 different body colors. By the way, the best news about those 12 colors is one called toffee metallic, which is actually "brown." Check it out below configured on the German VW site with old school, "roundie" wheels. The original Volkswagen version of that wheel was 13 inches. This one, just to give you some sense of the increased size, is 17 inches. On the inside, much like what Mini did with the Cooper when it was relaunched, it looks like Volkswagen's given the new Bettle a more modern and less-cute interior that looks like it ditches the hippie flower power vase and uber-cutesy interior. In its place is a tasteful redecoration that's so straight from the Volkswagen parts bin it looks like it could be found at home in any VW — and with the optional red leather seating inserts, any Audi as well. The 2012 VW Beetle is also the first VW model to get the new Fender sound system. The news under the hood is that for the first time in the U.S., the Beetle will be offered with a turbodiesel engine. The Beetle 2.0 TDI (103 kW / 140 PS) meets U.S. emission standards and still manages a likely (pending EPA certification) 40 mpg fuel economy on the highway, 29 mpg in the city, and 33 mpg combined. Mated to the 2.0-liter will be your choice of six-speed manual or six-speed DSG. Take a look at this B-roll and the press photos from Volkswagen (one of them, as reader Sam points out, shows a NASCAR-demographic-pandering 2002-ish Dale Jr. Jacket with the Beetle) and then remember that this car was first teased on Oprah's show last year. Now, you tell us whether you think the Germans succeeded in making a Beetle that's more manly than the last one.